This equipment was originally developed for the cross cutting test. 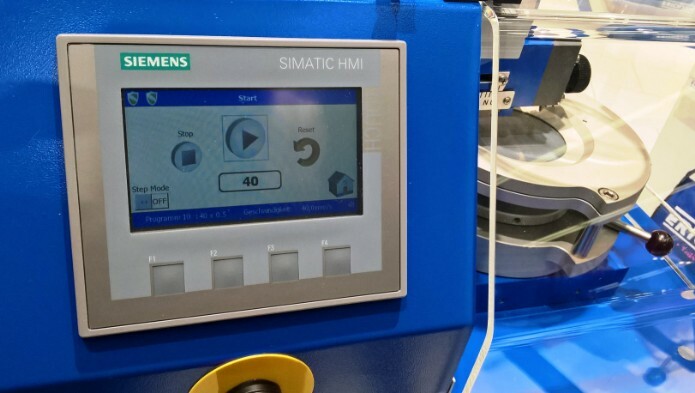 Today it is used by 10 of the best known motor (automobile) manufacturers and their sub-suppliers for testing coated metal and plastic surfaces in this industry. The test is even recommended by the VDA. 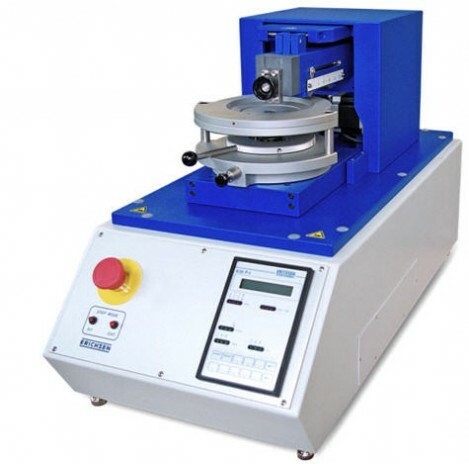 The cross cutting test, which is probably the most widely used test for adhesion will, if conducted manually, occasionally result in a pattern of variation in test results that depends on the users of the equipment. 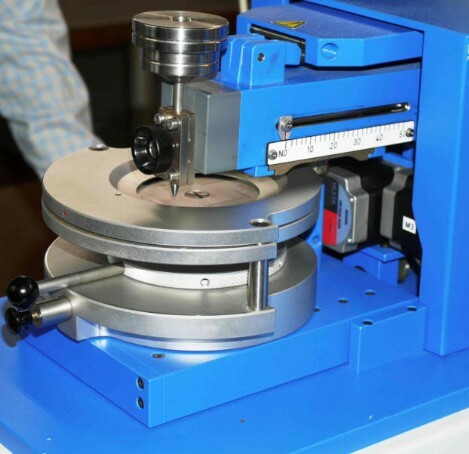 The SCRATCH HARDNESS TESTER 430P eliminates this inconsistency since the test procedure uses a pre-programmed electrically motorized drive. The substrate is fixed in a specimen holder. 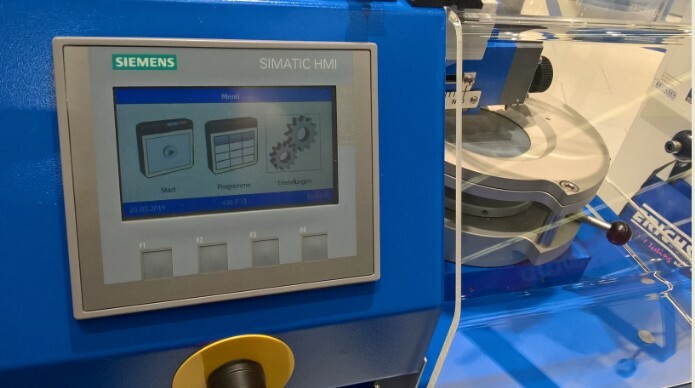 After setting the test force and starting the instrument the depth of the individual cuts is automatically reduced in a sequence of stages in accordance with a pre-selected pattern. Plastic components with an imitation leather surface, in most cases in the form of molded thermo plastics, have long been employed for internal motor vehicle furnishing. 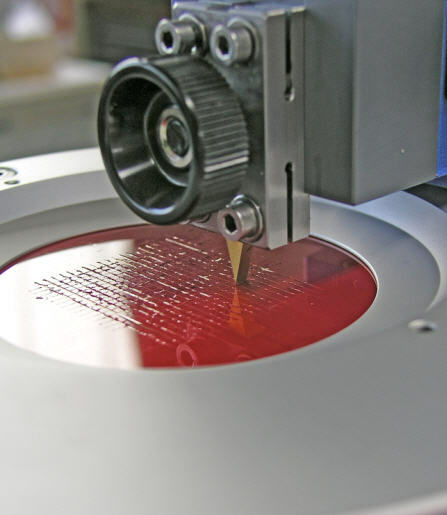 For testing the surfaces of these plastic parts tests similar to those described above, using a cross cutter tool (20 lines at 2 mm pitch) is employed. A relatively low test force of 5 N is applied. 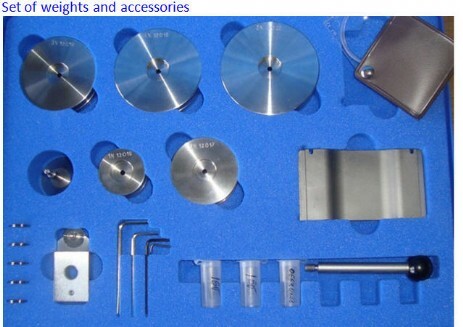 For this test, in place of the sharp-edged tool for the cross cutting test, a tungsten carbide test tool with hemispherical tip made of 1 mm diameter is used. 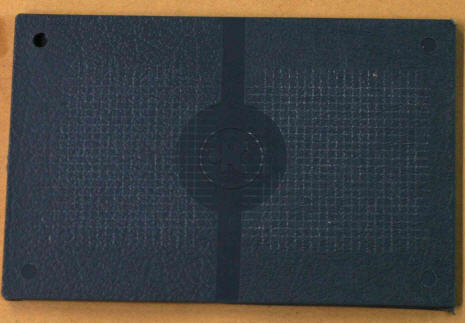 Ideally, if the material tested is satisfactory the process should leave no marking on the product. 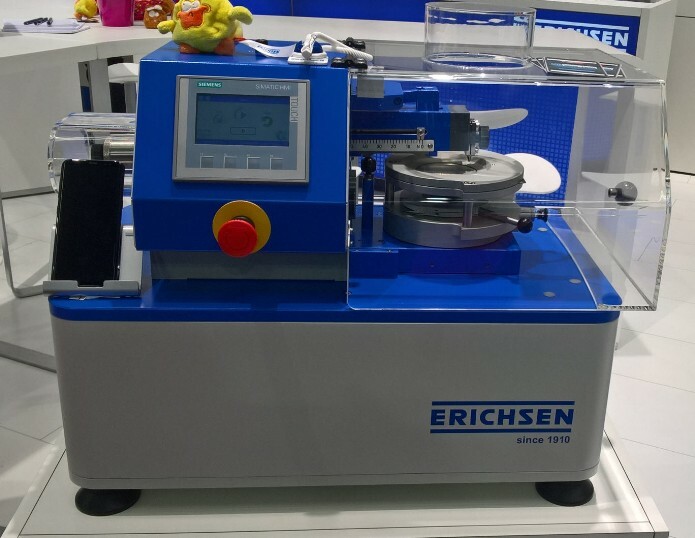 The motor-driven scratch hardness tester and cross hatch cutter, Model 430 P, is well-known and approved in the automotive industry. Now, the profile on performance has been enlarged by an additional function on frequent users request. 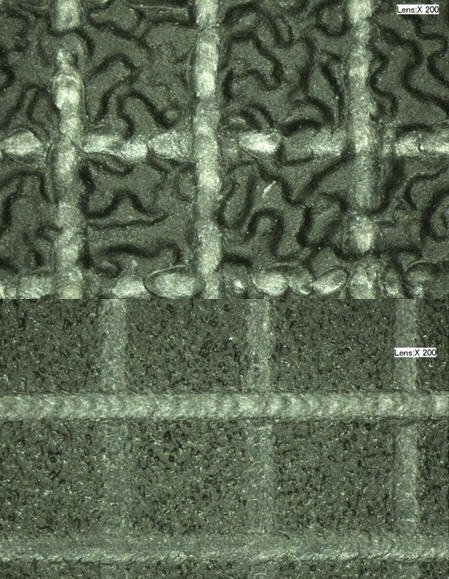 With the new version of Model 430 P parallel cross hatch cuts with graduated test forces are possible. After carrying out the first cross hatch cut the instrument can be stopped and the test force (up to 50 N) can be adjusted individually before starting the next test track. 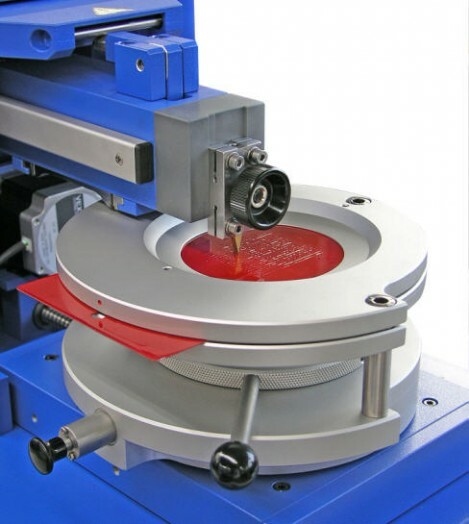 Theoretically, 80 test tracks with a distance of 0.5 mm of different test forces are possible within the pre-selected cross hatch cut programmed. 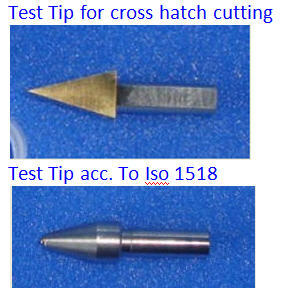 For a better differentiation and assessment of the cross hatch cuts a distance of 1 mm = 40 test tracks should be observed. Due to our experiences 20 test tracks are absolutely sufficient. With a distance of 2 mm they are easy to distinguish and can also be evaluated visually.